Jungle Red Writers: How's Your Summer Going? LUCY BURDETTE: Since amazingly enough Labor Day is less than a month away, I thought it might be fun to check in and ask about the highlights of your summer so far. We have been on a whirlwind of family events – two weddings and a new granddaughter. Oh, and two trips to California. The first was to Malibu for my darling nephew's wedding. It was a glorious weekend with lots of family time. We thought we'd be going back to California in August after our daughter's baby was born, but nature had other ideas. On July 21, all 5 lbs. 11 oz. of her made her dramatic appearance. Her name is Dorothea, after John's mom, and baby and her fabulous parents are all doing well. Tired, but that's to be expected with these new creatures. celebration was connecting with Joan, a cousin I hadn't seen in 40 years, the daughter of my mom's oldest sister. Those three sisters and all of us cousins spent many holidays and summer vacations together, but Time has a way of changing things. She was so lovely, and has many memories of my grandmother from living with her that I can't wait to hear. And we learned that my cousin Tom Isleib on the other side has an amazing talent for limericks, and my brother emerged as a limerick master as well. I will leave you with one example. You'll see the topic can be anything... And stay tuned for more limericks on Friday--and a contest! Cousins sent their men out to fetch lunch. "Bet it's Subway," said Steve on a hunch. Now we're lying around in a bunch. RHYS BOWEN: What lovely family time, Lucy. I'm so glad you got to enjoy all of these events. My summer seems to have been going on forever. I keep hoping there will be at least one moment to take a book under a tree and relax. So far I've been to England, saw the premiere of the play of my children's book, taught a workshop in Tuscany, visited the hotel where John's parents spent their honeymoon in Santa Margherita Liguri, did research in Stresa, visited friends in England. 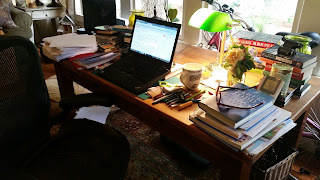 Then worked like crazy to finish first draft of next Georgie book. Was on the faculty of the Book Passage Mystery Conference and have just returned from a workshop in Kansas City and a book event for Crowned and Dangerous in Scottsdale. Next up is an event on Mackinac Island in two weeks. I'm planning to watch Olympics and catch my breath for a couple of days before I do anything else! HANK PHILLIPPI RYAN: After that? I am going to skip my turn. Rhys! You are astonishing, but it makes my Tanglewood-attending, (Mozart and Mahler) and cataract surgery (life-changingly amazing) and book tour planing for SAY NO MORE (November!) pale in comparison. Still! I am having a very nice summer. Working working working. Today I reached word 55,555 in UNTITLED. Yay! HALLIE EPHRON: When I'm not on the road (right now I'm in Portland OR at the Willamette Writers Conference - a fabulous conference!) I'm chained to my desk editing two books and missing deadlines. When my kids show up I drop everything for family time, but my poor husband who's off for the summer is very much flying solo, poor guy, for a few weeks yet. JULIA SPENCER-FLEMING: I've managed to make a few of my summer bucket list items already: I've gone to see the Sea Dogs play ball in Portland AND the Rockies play the Pirates in Coors Field in Denver. I've had a fresh haddock sandwich at a lobster shack in Midcoast Maine. We've hosted friends for cookouts on our built-last-year patio, and I've spent the day up at Theatre of Monmouth seeing one of their excellent Shakespeare productions. I've also been traveling quite a bit - although all of us will sound like stay-at-home recluses compared to Rhys! I went to Syracuse to spend time with my parents, went to Colorado Springs to stay with one of my best friends. Along with the ballgame, we also rode the cog railroad up Pike's Peak, explored historical sites and spent an afternoon in an outdoor hot tub drinking wine spritzers. Bliss. The best thing so far? We just got home from Chicago, where we saw The Boy graduate from basic training at Naval Station Great Lakes! We stayed at the BEST hotel - the Deer Path Inn in Lake Forest. It was the perfect place to hang out and catch up with our son, and that had three separate restaurants, so we never even had to leave to find a meal. It was great seeing him again and seeing the positive changes the Navy has wrought on him already. SUSAN ELIA MACNEAL: It's been a summer of lots of travel — to Hudson, NY and Providence, RI. Now we're back in NYC (with the heat) and Kiddo is going to an engineering camp he really loves. I'm trying to write, as well as do the usual accompanying blog posts that come with a new book (THE QUEEN'S ACCOMPLICE drops on October 4). Did I mention it's hot? It's really hot. We're watching the Olympics in the air conditioning. And did someone say limerick? The town we stayed in in Rhode Island is called "Pawtucket." DEBORAH CROMBIE: I think I should skip my turn, too. I have spent my summer writing. I finished my book (only a year late) on July 18th. I collapsed for a couple of days, then spent a week madly gathering material for Laura Maestro, the wonderful illustrator who does the endpaper maps. THEN I started revisions. The book went to copy edit on Friday. While I wait for the copy edit, I'm working on revisions for the German version. That is it. Lucy: Red friends, how are your summers going? So busy. Cleaned the garage (big job), shaped up the garden, watched my daughter get her Master's at Columbia, spent a three weeks in Europe, picked many quarts of wild blackberries, wrote half of a book and a quarter of another, and hosted a cookout for two dozen friends and family. Next: a week in California for visiting and a family wedding, then a two-week road trip with Bouchercon in the middle. I think I need some serious downtime! Julia, congratulations to your son on his graduation from basic training. What comes next for him? It’s so exciting to hear about writing, finished books, and book tour plans. And while the Jungle Red ladies have been busy traveling, we’ve stayed home [although we are planning a short trip to Norfolk to see our youngest daughter and her family before school starts for the kids]. Family things have filled most of our summer, and that’s definitely been a good way to spend these days . . . . I am a slug! We stayed home this summer. Not a loss though, I've almost finished Death Dive. Two-thirds through is almost finished, right? Been hanging out in Barnes & Noble in Fort Myers. Last trip through I snagged Julia's Through the Evil Days. Looking forward to a cool read, and this summer has been so hot that I'm looking at the cover for relief! What full summers! Although I wish Julia had mentioned WRITING in her list of activities (we're in serious Clare/Russ withdrawal here, Julia). Me, I've been working all summer. But that includes a few mornings with pen and paper at the beach and two writing retreats with author pals (one more next week!) in lovely settings. But I've also made time to pick blueberries, enjoy G&Ts on the deck with a book, and soak up all the fabulous summer produce. Last week in Maine with my sons, sister, and Hugh was a complete break and also perfect. I read nearly a book a day, too. Karen, wow, you do need some downtime! Edith, glad you got a nice week of doing nothing...On Rhys's recommendation, I've gotten into Kate Morton and really enjoyed THE LAKE HOUSE and THE SECRET KEEPER. These Reds summers are sounding so sweet and peaceful! And I saw a hummingbird moth--which was astonishing. Have you ever seen one of those? YIKES! My big summer adventure has involved the gutting of the kitchen to the studs and rafters, plus plumbing the powder room and then painting the dining room. That began three months ago, and we are on the downhill slope. The only fly in the ointment was the failure to order the cabinet that goes over the fridge. So that delayed things three weeks. Then when it did arrive, Fed Ex managed to back over it. Another three week delay. However my wonderful contractor neighbor kept me with a sink, range top, microwave and fridge working for all but a couple of days. Today he will hang a Braque repro, "Three Blue Plums", over the sink, in the space between the top of the window and the ceiling. This art work find tumbled down from our attic, and it is perfect in theme, colors, and style for our kitchen. The big trip of the summer is next weekend when we drive to NH for the wedding of dear friends. Julie promises me our adored cuccina will still be here when I return. This week, in between seeing to a stress fracture on my foot and dealing with a wee bit of dental surgery, I have a photo shoot for a commercial for a local bank. What a whirlwind life, no? Oh my, Ann - that is a noble cause. I hope to never have to do another renovation. The one we did 25 years ago nearly did me in. I'm back from Oregon and Washington and in withdrawal from GREEN and MOUNTAINS. Happy to look at my calendar and see no more travel until into the fall. Settling in now to write. Oh, I saw a hummingbird moth too Hank. Last year it was hanging out at one of the butterfly bushes I have planted. Never saw one before and haven't seen it since. It was a jolly looking thing! Every year we get at least one hummingbird or Sphinx moth, Hank. They look so much alike I put them both in the same category, unless Steve is here to identify it. They like the same flowers hummingbirds do, any with tubular shapes, and they are also good pollinators, so we are always happy to get one visiting. So many activities! Julia, you must be enormously proud of all your children, and now with a Navy son! And isn't Lake Forest a magical place? I was there about 16 years ago, when my middle daughter was looking at colleges. Couldn't talk her into going there, though. Julia, congrats to your son! I feel like I've been careening from thing to thing. But when I look back, I really haven't done anything. I got the kids through another (and possibly their last) summer swim season. The boys have gone a lot of places, but I haven't. Well, I went on my much-anticipated retreat with my Sisters in Crime chapter last weekend (a bit hot and the basement was apparently unusable because of mold/mildew, but it didn't really bother me - no health issues affected by no A/C and I'm used to living without it in my house). The biggest thing I've done is drag The Boy kicking and screaming (well, not actually, but still) toward his first year of high school and assure The Girl that she will get into a good college and not graduate with a boatload of debt (unless she chooses to go to an outrageously expensive undergrad school). Oh, she announced that she wants to do a "gap year" in Europe with a friend. I said awesome, how are you going to pay for it because I can't afford to send to you to Europe for a year and I'm pretty sure your college fund can't be used for that purpose. Oh, and The Girl turned 16 so there was the whole "getting the learner's permit" thing and now there's the "learning to drive" thing. But fortunately The Hubby has taken that responsibility, so it's off my shoulders. Still, looking forward to the cooler temps and pretty colors of fall. Spoke with my youngest daughter yesterday. She said, "I'm 37 weeks!" I asked, "How many weeks are full term?" (I only know from months.) "40." Huh!? She's due Labor Day weekend, so how could that be three weeks? Lots of family and fun this summer -- but not enough chill time (I know I can't complain about Cape Cod weather, but we don't have AC). Lucky to have access to my neighbor's pool and a twice weekly water aerobics class. Big birthdays this summer -- my husband and I are both turning 70 & my mother will be 91 on Wednesday. I am so jealous of anyone READING this summer. Although I have gotten back to it a bit after I finished the ms, but I would just like a day or two before the end of the summer when I didn't have to do anything but read. And it would be cool enough to sit outside, or just maybe lie in the hammock! I'm so excited about my upcoming trip to Kansas City. It will be Wren's first flight, and Kayti's first flight when she was just two months older was to see the same friend, but then it was Seattle. I love when life makes such lovely loops. Three weeks after that, it's Bouchercon, and a couple of weeks after that, I'm speaking at a S-in-C workshop in the Bay Area, then hoping to make a trip to England in late October/early November, then it will be holidays and February book tour. So I really haven't minded this quiet summer at all. Joan, right now he's on hold at Great Lakes waiting for his A School to start. He'll also do C School (apparently the Navy doesn't have B School...) at Great Lakes. His rating is Interior Communications Electrician (Advanced Training) which is different from what he originally signed for, but just like everyone else in the military, you go where you're needed. Karen, we LOVED Lake Forest. Since it looks like the Boy (maybe I should start calling him the Sailor?) will be at Great Lakes for another twelve months or so, we're already planning a return trip. Mary, I think we may have the same kids, except right now they're all Youngest. She's going to be starting a new high school, and is all sorts of jittery about it, AND she's taking drivers ed. Tomorrow is her first day behind the wheel. If anyone lives in southern Maine, you have been warned. Oh, and she also once asked me about a gap year traveling in Europe. I told her if I had the money to travel the continent for a year I'd do it myself. Get a job, kid! After what I just paid for her haircut and highlighting - that IS her gap year! In fact, I think deserve a gap year, too! I want a gap year, too! With someone else to pay for it! Wow! Everyone's been traveling so much. I've been doing a lot of great reading, especially this month, as I read Rhy's Crowned and Dangerous and just last night finished Susan's The Queen's Accomplice (out Oct. 4th). Those two books were so amazing! Then there's reading for the upcoming Bouchercon, trying to get some new-to-me authors in. My husband and I did go to visit our son and his girlfriend in June, and I took my daughter and my granddaughters on a trip to my hometown. The little one, Isabella, who turns seven in 12 days, told me today that she really liked walking around the town and seeing places where I grew up. That meant so much to me. She is such a sweetheart. With the Bouchercon trip in September, another trip to my hometown, and a possible anniversary trip, this fall will be my traveling time. And, when I think back on last year at this time, I was in much the position that Ann is. With a complete gutting of the main bathroom in March of 2015 (preceded by painting in living room and little library room), there was painting, new floors, and light installation going on up until November. So, I'm actually glad to have had a pretty tame summer this year. Julia, I know you must be so proud of your son. I wish him well in his continued career in the Navy.